How much did you pay the last time you visited your dentist? Most probably, you ended up burning a hole in your pockets! The average cost of dental care per patient per year was $685 in 2013 and $1,775 if your visit included a dental specialist. Dental care expenses have surged in the last twenty years and will keep increasing by 5% annually. And the worst of all, 89% of traditional health insurance policies don't cover adult dental services. That means you have to pay it out of your pockets! Of course, you can go for separate dental insurance. However, that will cost at least $366 for an individual or $680 per year for your whole family. Is there any way you can avoid all these costs? Dental diseases are often incurable, life-long and expensive. Yet, you can prevent most of the dental damage from happening in the first place. What is the secret? A proper dental routine is your defense against tooth decay and gum diseases. And brushing is the most important thing you can do to ensure a healthy and beautiful smile! But millions of people don't know how to brush properly which lets plaque and bacteria build up on the teeth and gums. To make brushing simple and effective, all you need is the Ara Smart Toothbrush from Kolibree! 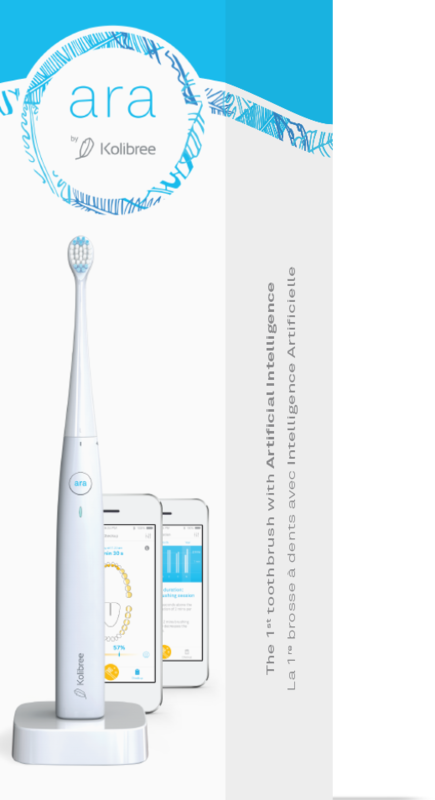 Ara is a revolutionary toothbrush which integrates Artificial Intelligence (AI) to offer you a perfect and comprehensive brushing. 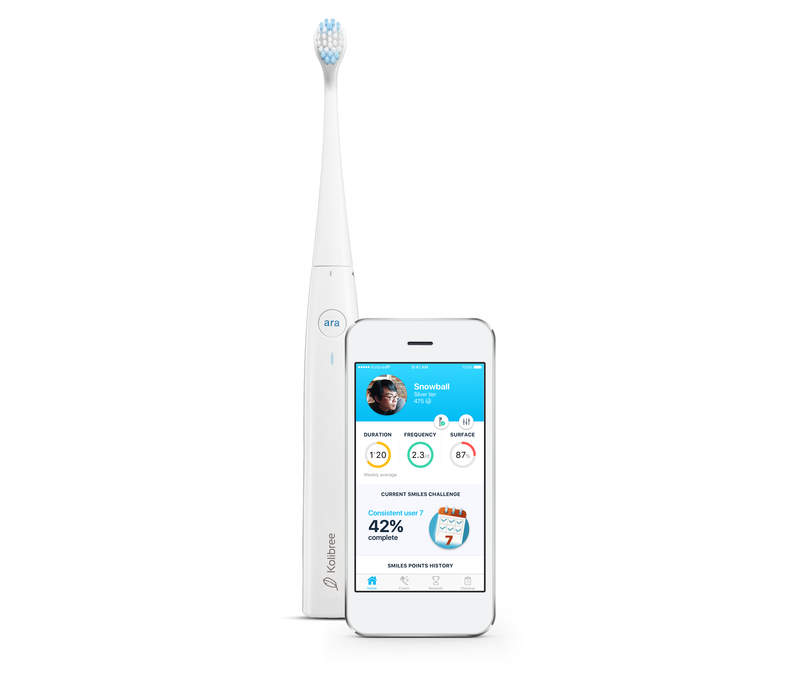 It comes with 3D sensors, accelerometers, gyroscope and magnetometer to track your brushing habits. Every aspect of your brushing like speed, rotation, the direction is picked up by the sensors and synced with the Kolibree App via Bluetooth. Embedded 3D sensors track your brushing and detect any spots you could be missing. With feedback from the app, you can clean every corner of your mouth effectively! The Kolibree App tracks the frequency and duration of your brushing habit and helps you improve through fun activities. Games and virtual coaching also enhance your dental care lowering risks of diseases. You also get weekly reports to know how you are doing! Ara uses a unique patented sonic technology which produces mild vibrations to remove plaque and prevent cavities. In fact, our research shows that Ara is two times more efficient at removing plaque in children compared to a regular electric toothbrush. The vibrations also increase the blood circulation in your gums and make them healthy. Ara weighs only 2.5 ounces and comes with 2-week battery life. It's perfect for travel and fits nicely inside a small pouch! You also don't need to worry about internet all the time as it comes with an offline mode. All your details like date, time, duration and zones brushed are recorded offline even when you don't have WiFi. Ara comes at only $129 and saves hundreds of dollars of dental costs.